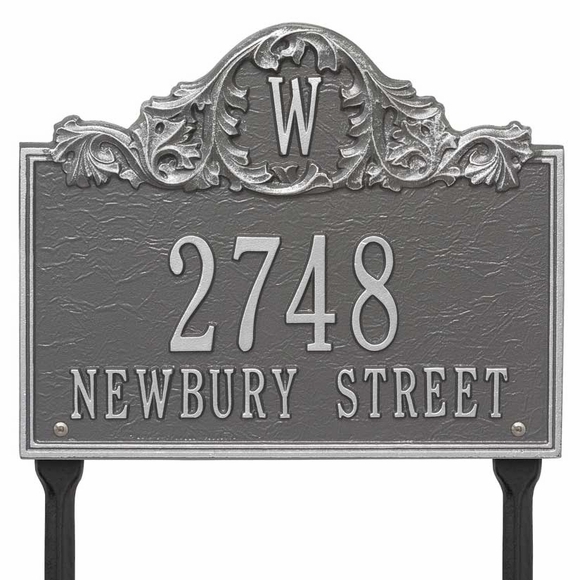 Personalized Acanthus Monogram Address Sign - - lawn mount 14" x 11.25" arch plaque holds one monogram letter surrounded by acanthus leaves and two lines of personalization. Made in USA. Includes two 18" lawn stakes for convenient set up. Large image color is pewter/silver. Smaller images colors (from left to right) are antique copper, black/gold, bronze verde, oil rubbed bronze, bronze/gold, and pewter/silver.